This article originally appeared in the May 2018 issue of Compoundings, a monthly magazine published by the Independent Lubricant Manufacturers Association (ILMA), www.ILMA.org. For decades, the tractor hydraulic fluid (THF) market has been riddled with low-quality fluids that are sold to consumers as legitimate THFs. 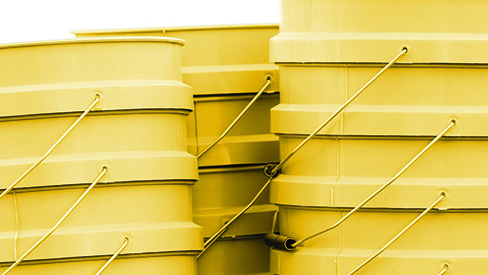 These fluids are often sold in attention-grabbing, yellow five-gallon pails, hence the nickname “yellow buckets.” Lubrizol estimates that yellow bucket fluids account for approximately 25 percent of all THFs sold in the U.S.
For equipment owners and operators looking to cut costs, yellow bucket fluids are seen as an attractive alternative to the more expensive original equipment manufacturer- branded (OEM-branded) fluids. Unfortunately, the claims made on these products are often vague, confusing and misleading, with generic statements such as “for use in older tractors,” or in some cases multiple OEM brands are listed without any reference to performance specifications. If a specification is listed, it is most often “303,” which is a reference to John Deere’s JDM 303 specification. Many consumers are unaware that John Deere’s JDM 303 specification has been obsolete since 1974. In order to meet the specification that existed more than 50 years ago, fluid formulators and marketers used sperm whale oil as a friction modifier. Due to animal conservation efforts, sperm whale oil was banned in 1974 and could no longer be included in any fluid formulation. Fluids blended today contain very different friction modifiers and base oils compared to the original formulations. There are several other reasons a fluid labeled solely as 303 can be misleading for consumers. JDM 303 performance testing is no longer available. Therefore, any product that was introduced over the last three decades that makes this claim simply cannot be validated. Demands for increased efficiency and maximum uptime, as well as hardware requirements of tractors, have evolved by leaps and bounds since 1974. As equipment manufacturers, such as John Deere, have evolved their hardware to meet market demands, the demands on fluids have changed as well. With the introduction of new hardware, such as wet brakes, John Deere developed new specifications to properly account for performance demands on the fluid. JDM 303’s replacement, J14, was upgraded to J20A with new requirements added such as oxidation stability, wet-brake performance and friction. John Deere’s J20A was upgraded to the current specification, J20C, which was introduced to include Allison seal and modern hardware requirements. Simply stated, the JDM 303 specification does not meet the requirements of today’s tractors. There is a small segment of the market that might argue that older tractors are still in use and that those tractors list 303 fluids in OEM manuals as a requirement. The JDM 303 specification was designed to be used in tractors produced between 1960 and 1974. Based on Lubrizol’s estimates of equipment in operation, less than 2 percent of tractors would still require this fluid. Fortunately, fluid that meet the current JDM J20C (high viscosity for summer) or JDM J20D (low viscosity for winter use) specification are backward-compatible to obsolete specifications, such as JDM 303, and can service the limited number of older tractors that are still in use in fields and farms across the country. Therefore, there should be no demand for 303 fluids in the market today. So, why are 303 fluids still being sold? These low-quality fluids are often sold at a fraction of the cost of fluids that meet the J20C specification, which is attractive to cost- sensitive consumers. A portion of 303 fluids might even be used in applications other than tractors, such as forestry, construction, irrigation and mining equipment. However, what many consumers don’t realize is that there is no valid technical specification to guide the formulation, hence, fluids are often blended with line flush, or that they are using down-treated additive packages that have not been validated for use in these applications. Fluids that are blended with line flush oil may contain some residual additives from engine oils, automatic transmission fluids or gear oils. Some fluids can contain a mix of all of these additives. This often results in a low viscosity index, high pour point and extremely high Brookfield viscosities (i.e., poor low-temperature properties). Fluids that do not flow well over wide temperature ranges can cause premature pump and equipment failure. Lubrizol’s testing of 303 fluids has shown an average 25 percent viscosity increase over 100 hours of measuring oxidative stability. In other words, these fluids have been shown to thicken during extended use, which can result in many problems, including erratic or sluggish hydraulic response due to deposit formation and strain on the hydraulic system. Hydraulic pumps contain yellow metals; therefore, copper strip performance and copper corrosion are important measures to consider as they protect against metal fatigue. The inferior performance that 303 fluids have exhibited during testing is an indicator of reduced pump output and, ultimately, hydraulic system failure. The use of 303 fluids can also result in severe wear and ridging of gear parts. Most 303 fluids fail the L-20 hypoid gear test, which measures the fluid’s load-carrying capacity, after only the first 83 minutes of a 40-hour test. J20C also added the Allison C-4 test requirement, which most 303 fluids fail, resulting in seal leakage or failure. Across the board, testing has shown that yellow bucket fluids that contain low-quality base oils and improperly balance, or inadequate additive systems simply do not deliver the performance level required to adequately protect equipment in the field — whether old or new. There are other fluids that contain a down-treated additive package. This is used primarily in products that claim to meet JDM J20A. Petro-Canada Lubricants notes that the key difference between JDM J20A (which is replaced by the current JDM J20C or JDM 20D specification) is the addition of the Alli- son C-4 seal, oxidation, wear and frictional characteristics test requirements — a fact that is not commonly known. To have adequate performance the same additive concentration in the final blend is required to meet the adequate tractor performance requirement of JDM J20A as for JDM J20C or JDM 20D. As a result, a down-treated THF has performance pitfalls very similar to 303 fluids and has not been fully validated against tractors’ needs both now or in the past. Some equipment owners and operators are led to believe that yellow bucket fluids are legitimate THFs when they are anything but. Others might be aware of what they are purchasing but believe that the fluid is not in the equipment long enough to make an impact. However, each day that an improper fluid remains in a piece of equipment, the chances of a costly repair, dreaded downtime or safety issue increase. The fluid may leak because it has compromised or destroyed the seals. In more serious cases, a leak may occur because the hydraulic system is not functioning correctly or has completely failed. A failed hydraulic system can result in significant inefficiencies, including additional fuel consumption, loss of productivity because of imprecision or additional downtime, and increased costs. Finally, the use of 303 fluids might also result in brake chatter and, more importantly, compromised operational safety. Nothing should be more important to the lubricant industry than doing everything within our power to ensure that we are providing consumers who know and trust our brands with safe products that will provide protection and performance. It is our duty as an industry to educate consumers about these issues and ensure that we are as transparent as possible when it comes to protection and performance claims. Recent lawsuits have raised questions about the quality of THFs in the marketplace, and Missouri and Georgia have banned the sale of products labeled as 303 fluids. Consumer protection divisions within the state governments of Missouri and Georgia conducted a significant amount of testing and came to the realization that the labels on 303 fluids are misleading and the fluids’ quality fails to meet OEM requirements. Both states agree that fluids need to meet the performance requirements of an OEM specification for it to be sold as a THF and that generic claims such as “for use in John Deere, Case IH, White Farm […] tractors” should no longer be made. Industry organizations, such as the Petroleum Quality Institute of America (PQIA), have been strong advocates for the use of lubricants that meet current specifications. For years it has warned consumers about the dangers of 303 fluids. The organization has been conducting market testing to warn consumers about products making false claims, and THFs will likely be no exception. Lubrizol continues to educate consumers about the consequences of low-quality fluids and advocate for higher-quality lubricants through the TractorLife.com Authenticated Fluid Program. The program was created to educate the industry and help consumers clearly identify certified lubricants that have been proven to perform and protect. Participants of the program are required to meet or exceed performance require- ments outlined by OEMs. With the help of newly created educational content on TractorLife.com, Lubrizol hopes to further emphasize the importance of using high-quality lubricants through the five key aspects that consumers should expect from a fluid: wet brake control, instant performance, proven part protection, power under load and sludge-fighting. After all, hard-working farmers, harvesters and equipment owners and operators rely on lubricants to protect and operate their equipment. The lubricant industry owes them our best. Industry organizations such as ILMA and the Petroleum Quality Institute of America (PQIA) have been strong advocates for the use of lubricants that meet current specifications. As part of the Association’s code of ethics, ILMA’s blind testing of member products, including THFs, has been ensuring a level playing field for all members and products that give the performance promised on the label. For years, PQIA has warned consumers about the dangers of 303 fluids. That organization has also been conducting market testing to warn consumers about products making false claims, and THFs will likely be no exception. Kuthoore is general manager, North American sales at Lubrizol Additives.